I love electrical problems. I love them like I love ingrown toenails. I love them like I love getting speeding tickets. I love them like I love getting phone calls from my children telling me they have dropped ANOTHER cell phone in a toilet or a sink at work or jumped in the swimming pool with it in their pocket. Lately my electrical problems have been related to the transmission system. When I pull the shifter to change gears the warning tone goes off. 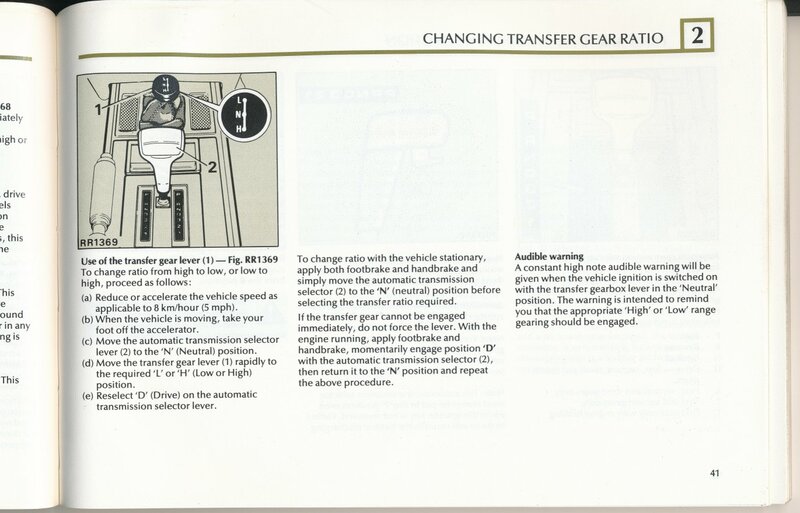 Here is the page from the Range Rover Owner’s Manual 1993, Page 41. Just before I took the Range Rover out of service RovErica and I had been seeing the odd Code 69. And during the really, really cold weather the tone would sound randomly. DietMtDrew thought that was, “the coolest code ever”. Great, teenage boys, I’m pretty sure that is something he and I should talk about. Anyway, it looks like I have something going on with the switches and monitoring of my transmission. I am guessing the next thing is to find all the electrics and check the connections. Right now the engine and transmission are hot and will need to cool. With the weather change outside that will be easy. Today the temp outside was 57 (F) degrees. It is interesting that when I started this project the temperature is 107 (F) outside. By the time I finish this project, and I say finish in a “finish for now” sorta way, the temperature will be closer to 37 (F) outside. The engine and transmission were hot, because I swapped the transmission fluid in the transmission. And after I swapped it I went for a little drive. The fluid that came out was a nasty color and had a burnt smell. That was totally expected. If you have read the blog you know I burnt four gear pulling the camping trailer back from Fort Sill where I took possession from military surplus. I ran an errand early this afternoon to fill up my wife’s Honda CRV with petrol and while I was out I bought a gallon of Mercon/Dex-a-something-or-other. I read a blog post where swapping the fluid was as easy as dropping the fluid and pouring in a gallon of new fluid. It took a little more than a gallon to top her off. While I was working on replacing the center console I managed to damage the emergency brake position switch. And now it’s broke. I’ll get to that after I sort out the last of my lovely electrical issues, brake light. The last time I shut the Rover down all was well. When I started her up this time, I have a nagging brake light illuminated in the warning lights. Nothing has changed in that system from the last time I drove her so I’ll have to get under and check all the sensors and pray I find a loose wire somewhere. It’s a lead pipe cinch it’s not the emergency brake position switch. This entry was posted in brakes, electrical problems, Range Rover Classic, restoration, transmission. Bookmark the permalink.